Home care businesses provide care for seniors in their home. This type of service satisfies the demand of the elderly in Thailand who prefer the comfort of their homes. The scope of business has been expanding to cover a wide range of services, from basic health care to more fully integrated services. One commonly used model to expand this business is through selling, as it requires low set-up costs and provides a high return. The management system provided with the franchise should cover the caregiver selection process and training to ensure a high standard of care. The market size of the home care market is expected to grow given an aging population in Thailand. Standards for caregivers and efficient management systems are key to success for the home care business. Existing schools can provide training specific to elder care to caregivers with high standards. Those with basic nursing skills and medical knowledge have more advantages as aspiring caregivers. Therefore, businesses in the healthcare industry such as hospitals, which already have qualified personnel, can easily expand into the home care business. In addition, service providers can utilize IT systems to help match caregivers and senior clients and to help plan types of care needed. The IT system can also be used to record data to improve services going forward. Home care services will address the need for caregivers by the growing population of elderly people in Thailand. At present, there are 11 million elderly people in Thailand, or 16% of the entire population. By 2031 the share is projected to reach 19 million or 28% of the entire population, making Thailand a full-fledged aged society. A survey by the EIC finds that more than 90% of the elderly in Thailand want to stay in their own homes after retirement. Moreover, as society evolves, the size of households is now shrinking to an average of only three members per household. When adult children/grandchildren go to work during the day no one is left to care for elderly while they are gone. Care is especially needed for those who are home and bed bound elderly. Life expectancy is also expected to rise. 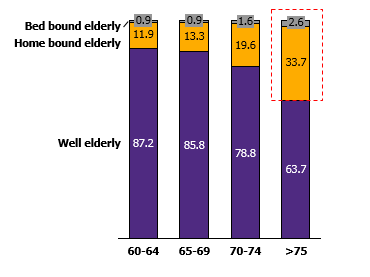 By 2020, average life expectancy will reach 80, making care needs of home and bed bound elderly grow by 36% (see Figure 1). Furthermore, home care costs three times less than care at hospitals. These factors present opportunities for home care businesses to respond to rising demands from the elderly in Thailand. Home care businesses will expand to cover more service areas beyond senior health care. An interesting example is home care businesses in the U.S. that provide not only basic services such as daily assistance with physical movement, doctor's appointments, medicine preparations, but also comprehensive care such as healthcare that requires nursing skills and physical therapy to prevent, treat, and rehabilitate. Some companies also provide fully integrated services that includes homemaking such as housework, meal preparation, and mental support. The latter is in the form of companionship for the elderly through various activities to reduce loneliness. In fact, findings suggest that people aged 65 and above who use home care services in the US need skilled nursing services for as much as 84% of all services (Figure 2). In the future, this type of service will likely be in high demand in Thailand as well. Even though the home care market in Thailand is still small, there is much room for growth. Key advantages of this business are the low investment costs and simple management system. The challenge is finding high-quality caregivers with nursing skills. Home care service accounts for only 20% of the market share in Thailand, second to nursing home services. However, it is becoming more popular and experiencing high growth. In the past five years the market size for home care grew an average of 7% per year. Moreover, in the past two years home care profit margins have doubled, while nursing home profit margins have declined. The key advantages of home care service are easier management and low start-up costs. A business with personnel trained to provide care for the elderly can enter the market right away. Nursing skills and medical knowledge can be a bonus, but are not necessary. More importantly, home care services overall can better meet demand from the elderly than nursing homes. This is because they allow the elderly to stay in a familiar environment without much adjustment. In addition, comparing monthly expenses between the two types of services, home care is around 10% cheaper than a nursing home. Expanding home care services using a franchise business model presents an interesting investment opportunity. In the U.S., total revenue for home care grew 5% per year (Figure 3) through continued franchise expansion. The three major players in the U.S. home care market, Right at Home, BrightStar Care, and Synergy HomeCare, are ranked among the most popular franchise businesses with low start-up costs. The three companies combined have 1,162 franchises. Some providers made as much as 1.6 million US dollars from their franchise business within one year and continued to expand abroad in the U.K., Germany, China, Canada, Japan, and Australia. The franchise business model provides confidence in service standards for both franchise subscribers and customers, as it already lays a foundation for management systems. The system covers processes such as caregiver selection, background and skill checks, training schools to ensure high-quality and standardized services, and matching between caregivers and the elderly. The franchise operator also provides medical instruments for rent to those under care as well. In addition to market growth, technological progress also helps increase the value-added proposition for home care businesses through improvements in service quality. Several home care providers have introduced IT systems to improve services. For example, CareLinx, a popular home care provider in the U.S., is recognized by the American Association of Retired Persons for using IT to increase business competitiveness. The company continued to provide services to over 150,000 individuals, an increase of seven fold in 5 years. Its IT system is used to match a caregiver to a senior via mobile application in both the iOS and Android platforms. The application provides information on the profile and experience of available caregivers. A prospective client can then choose a caregiver at an appropriate price more conveniently and quickly. Moreover, the application can record daily care activities so that family members can access the information. This allows for a smooth transition in case of transferring a customer from one caregiver to another. The record is also useful for doctor's appointment. In Thailand, some providers such as Health at Home have already introduced IT systems to improve service quality and expand business. Hospitals are positioned to have advantages in entering the home care market over other businesses. With reputed medical personnel who are knowledgeable and experienced in the field of health care, hospitals can benefit from investing in home care services. This can be done by using existing knowledge and experience to train caregivers to understand the needs of the elderly and set standards for efficient services. High standards will project dependability and trust among the elderly. Hospitals can also link information from home care services for a given patient to the medical record in the hospital to further improve services. 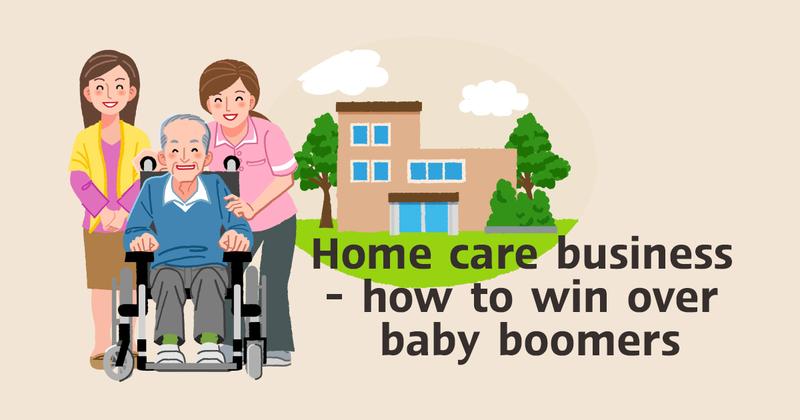 Businesses in related industries, such as medical instruments, home renovation for the elderly, and construction materials will also benefit from the growth in the home care business. Demand for medical instruments used at home will increase along with care needed by the elderly in everyday life. Examples of instruments needed include blood pressure monitors, blood glucose meters, hospital beds, and wheelchairs. Improving these instruments to meet international standards can create confidence in clients. Additionally, those in home innovation and construction materials can respond to the aging trend by designing products and home interiors to make them more suitable for the daily life of the elderly. New products should make it easier for elderly clients to move around and provide safety. Figure 3: Revenue from nursing home and home care businesses in the U.S.